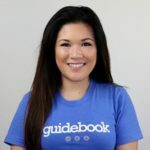 Jessica Weaver, student employee in the First Year Experience Office of Saint Leo University, uses Guidebook to champion an effective mobile strategy. If you’re not communicating with students on mobile, you’re probably not communicating with students at all. That’s the reality of today’s higher ed campus. Students are tied to their mobile devices more than ever before, and to create maximum impact, it is important to share information in the most beneficial way possible. A practice increasingly adopted by colleges and universities, the shift from paper to digital is a great opportunity to establish better lines of communication with students. Read more about how student champions at St. Leo University have driven an effective mobile app strategy here.